Education and schooling in Edward Cain’s memoir isn’t one of the most detailed aspects of his life that he discloses. There are suggestions that school life wasn’t the most pleasant as Cain also shares a story of when he and his brother were moved from school because of a discrepancy with the priest. Education seems to be a more prominent feature of Cain’s life as he got older. 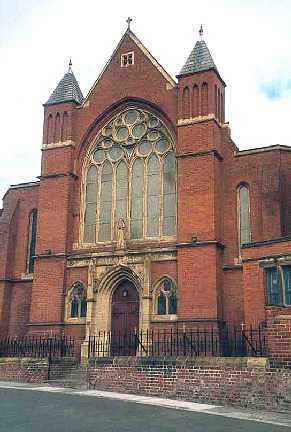 St Benets Church, Sunderland, was formerly St Benets Church and School, where Edward Cain attended as a child. ‘I started school at the age of 5, I was taken to St Benets School’ (pg 1) a school which was connected to the church. Although there are no references to Sunday school, religion played a part in Cain and his brother moving from this school. The anecdote written in the memoir details how the priest asked those who didn’t attend church on Sunday to stand, and proceeded to physically punish Edward Cain’s brother, Jack (as he was the oldest of those who didn’t go to church). After returning from school, Edward told his mother about what had happened, ‘and when she examined Jack’s back she immediately send for Dr Carruthers who wanted to prosecute the priest, but dad said no’ (pg 2). This shows that corporal punishment within schools was becoming frowned upon as the brothers were kept from school and even the attendance officer ‘wanted to deal with the priest’ after he saw what he had done to Edward Cain’s brother. After this, the brothers were moved to Southwick Board School after their mother ‘decided to take a hand in the matter’ (pg 3). Education and schooling is not detailed after this point. After having to move home due to his father having to move collieries for work, Cain mentions that his new school was called Boldon Village School. Cain also writes that he entered the pit in 1905, which would make him around 14 years of age. Later in the memoir, Cain revisits the topic of education as he becomes in need of mentoring to gain a job and writes that his education when he was younger was lacking. He found that he had to work harder to make up for the lack of education. As well as learning mathematics to pass the exam, he took up playing violin under the guidance of Mr Smith. ‘Under the guidance and supervision of Mr Smith, I learned quickly and soon passed an examination to be deputy overman’ (pg 6) This shows that without the education and tutoring he received when he was older, he would have missed out on important career opportunities. Usually education is an important aspect of life when a person is younger but Cain has shown in his memoir that this isn’t necessarily the case.